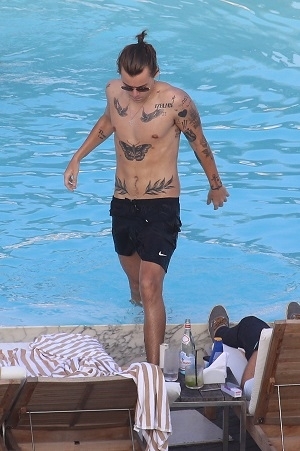 First, we saw Harry Styles strip down poolside in Rio de Janeiro on May 7. Now, new photos have been revealed that show Zayn Malik and Liam Payne getting in on the action on May 8! The young men of One Direction are certainly not shy about taking off their clothes, and we're not complaining. 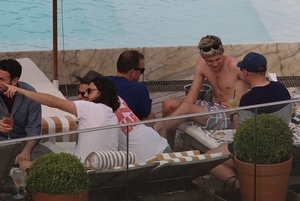 The boys enjoyed some shirtless downtime at their hotel, before their second concert in the Brazilian city. Of course, all the boys completed their poolside looks with their greatest assets — their toned abs and pecs. And don't think Harry sat this one out. He was also seen having fun and relaxing for yet another afternoon with his bandmates. One day prior, Harry stripped off his clothes and showed off his many tattoos, after he was jokingly tossed into the water. Niall Horan's hot body was also on display, so now we're wondering — where are photos of Louis Tomlinson? We have a feeling it'll only be a matter of time before more pics are released. Since One Direction arrived overseas — for their "Where We Are" world tour — they've been sightseeing and enjoying their downtime. Last week, Harry and Liam photobombed a tourist's selfie on Machu Picchu in Peru. The photo, uploaded to Instagram by mrmiatke90, was captioned, "Ticked off two boyhood dreams today, 1. Went to Machu Picchu 2. Met one direction.#onedirection #machupicchu #1D #omgitsharrystyles." Liam seems to be enjoying the band's adventure as he tweeted on April 28, "My real job is explorer all the rest of the stuff just part time keeping busy." What do you think? Do you wish you were One Direction, traveling the world while doing what you love? And how much do you love these shirtless photos of the band? Tell us in the comments section!